Vibroscreen utilizes gyratory vibration, the most effective method for vibrational screening. It causes 100% rotary motion and causes dispersion stirring & stratification of material to be sifted. Feed material constantly flows in Horizontal motion along a loop pattern on Vibroscreen surface. 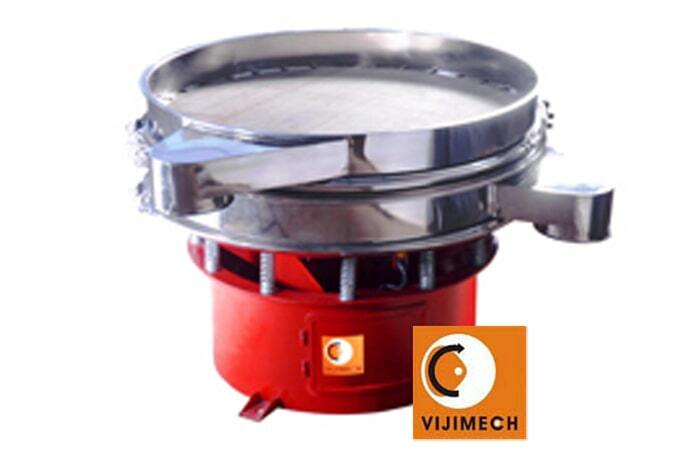 "VIJIMECH" vibroscreen sifter provides optimum screening & assures maximum feed-rate & efficiency. Vibroscreen are driven by a special type of vertically mounted motor having eccentric at the upper & lower end of the shaft. Rotation of out of balance top weight causes vibration in Horizontal plane whereas the rotation of lower weight causes tilt & vibrations in vertical plane. The heart of the Vibroscreen is its special heavy duty, Robust Motor, having out of balance weight at top & bottom. By changing their lead angle, various spiral-screening patterns are obtained to suit different application.It is also called Vibro energy separator.